Thank you for joining us in this first issue of our government affairs leadership publication for 2019. I’m proud to work with our government affairs committee. Last year we tracked more anti-fraud legislation than ever in the Coalition’s 25-year history. We’re already tracking more bills in 2019 than all of last year. Read on, and you’ll see the breadth of fraud challenges facing the fraud-fighting community. Medical, assignments of benefits, staged crashes, public-adjuster licensing, cybersecurity and privacy are just some of the bills debated across the U.S.
And we’ve filed amicus briefs that are defending the fraud fight in three precedent-setting civil cases already in 2019. We’re also teaching courts about the Coalition, and the importance of combating fraud. 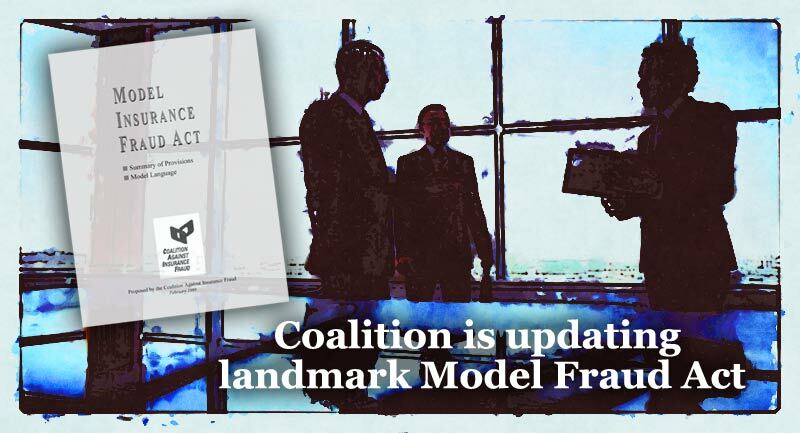 The Coalition also is updating our history-making Model Insurance Fraud Act. More than half of the states have adopted the original model in whole, or in part. As you’ll read, the Coalition’s influential voice is reaching major national organizations such as NCOIL and the NAIC as well. All of this — and it’s only April. We’ll promote a stronger fraud fight with America’s decision-makers throughout the year. Let us know if you have a question about any bill. And by all means, you’re invited to suggest cases for possible amicus briefs. Key topics on elected officials’ minds run the gamut of issues fraud fighters deal with daily: Regulation and licensing of roofing contractors and public adjusters. 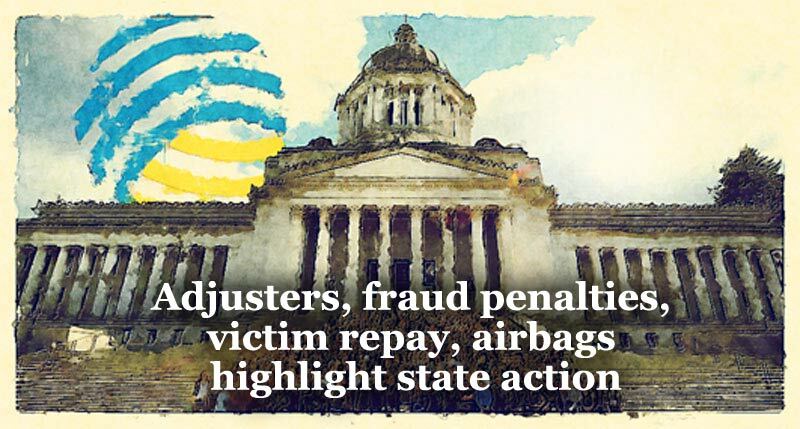 Permitting restitution awards for fraud victims, funding for increased anti-fraud programs and regulation of surprise medical bills also are on tap. Cybersecurity and data privacy reforms are, of course, continually front and center with elected leaders and their constituents. • Virginia. Four new laws are on the books, leading the U.S. They range from stricter public-adjuster licensing, to prohibiting the marketing and installing of counterfeit airbags. Speaking of airbags… Nebraska and North Dakota also have booked new airbag laws, and bills are pending in three other states. • North Dakota. Expand fraud penalties and classifications to boost prosecutions. • Montana. Increased restitution to fraud victims. • Kentucky. Strengthened insurance-fraud penalties, and requires more reporting of suspected medical scams. • Wyoming. Cracked down on Medicaid abuses by creating a fraud control unit within the state AG’s office. Abusing assigned benefits. The battle to limit abusive Assignments of Benefits rages in Florida. One concern is that insurers pay the plaintiff’s legal fees in AOB-related suits against the insurer, no matter who wins. It’s called one-way attorney fees. Among other things, this provision tempts contractors and claimants to lodge fraudulent suits stemming from bogus and inflated home repairs. Looking Ahead. To date 11 bills have either died in committee or been withdrawn by sponsors for lack of support. With some legislatures already nearing the end of their terms, the frenetic pace of filings will no doubt slow as summer approaches. In states where legislators meet year around, however, expect the battles to continue. We will be there making certain the needs and concerns of the fraud-fighting community are heard by elected officials across our nation. Personal bad-faith liability. Fraud fighters can be personally sued for bad faith under a dangerous lower-court ruling the Coalition is working to overturn with a forceful amicus “friend of the court” brief in Washington state. Keodalah vs. Allstate is now before the state’s highest court. 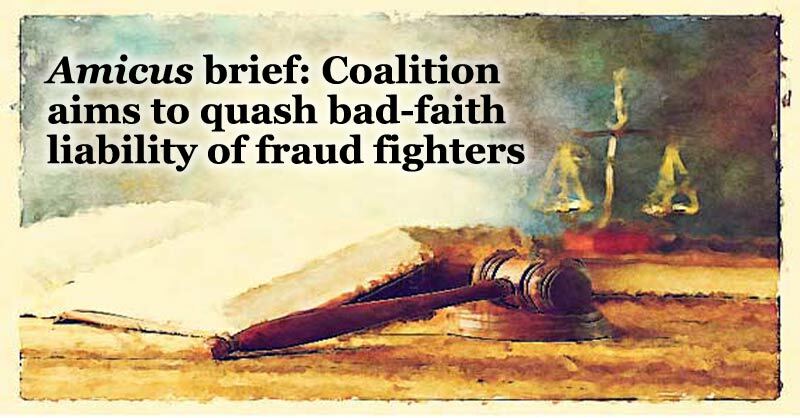 The Keodalah brief is one of three the Coalition has filed recently to defend the fraud fight in major, precedent-setting civil actions around the U.S. The Coalition has an active amicus program underway. Investigators, adjusters, lawyers, arson forensic experts and even IME physicians can be sued personally for alleged bad faith under the Keodalahruling. Fraudsters also can press bogus claims by threatening bad-faith suits that are patently false. The dampening effect on the fraud fight could be substantial. Investigators, claims handlers and other personnel would be discouraged from pursuing suspect claims. Their credit rating could take a hit with a bad-faith suit pending on their record, however spurious. They could lose loans, mortgages and even valuable job opportunities. Insurers should be held to high standards of good faith, and be encouraged to pay legitimate claims fairly and promptly. But investigators and claims handlers shouldn’t be forced to decide between protecting their personal finances and fighting fraud. Fewer fraud referrals will mean fewer investigations and prosecutions. Fraudsters likely will flock to Washington, knowing they have less chance of being caught. Organized fraud rings likely will threaten sue to gain leverage and get suspect claims paid, the Coalition warns. National implications: The trial bar and other supporters of the lower-court decision likely will seek to export the precedent to other states if it stands in Washington. Illegal corporate medicine. Unlicensed laymen must not be allowed to secretly own and run medical clinics in New York, the Coalition’s amicuscontends in Carothers v. Progressive Insurance. The court must uphold the New York’s law forbidding non-licensed physicians to own medical clinics. These shady relationships can turn clinics into fronts for scam operators. They bilk insurers with bogus injury-treatment claims. Trusting patients receive bad medicine geared more to maximize insurance profits than treat injuries. Insurers should be empowered to stop PIP payments if they suspect fraud. Without that right, insurers are forced to fund fraudsters who prey on innocent consumers and drive up premiums. Dr. Andrew Carothers clearly violated the state’s ban on the practice of corporate medicine. He claimed he ran MRI clinics, exclusively treating PIP claimants. Insurers grew suspicious and suspended his PIP payments. Carothers sued. Yet he had no clue who he employed and where his clinics banked. Nor could he explain why he earned just over $100,000 a year while his “bookkeeper” and “landlord” pocketed more than $10 million. Oral arguments begin May 1, and the Coalition will attend. We’ll also talk with legislators in meetings sponsored by the New York Insurance Alliance, in Albany. Abusing assigned benefits. All policyholders must consent in writing before a claim can be assigned over to a contractor or other third party in Florida, the Coalition’s strong position contends in Restoration 1 vs. Ark Royal. Widespread abuses of assigning claims to shady contractors are leading to bogus home-repair claims that drive up premiums in many areas of Florida. Ark Royal can help clarify conflicting lower-court rulings on this important aspect of Assignments of Benefits in the Sunshine State. The 5th district appeals court said yes to requiring everyone’s written consent, while the 4th district said no. The state Supreme Court is stepping in to clarify. A single insured shouldn’t be allowed to sign away all rights under the policy — including the right to sue the insurer, the Coalition asserts. All policyholders must consent in writing. A decision is expected later this year. The Coalition’s position is one of strict consumer protection. Legislative AOB reforms also are being debated in Tallahassee, with state CFO Jimmy Patronis and insurance commissioner David Altmaier supporting rigorous measures to rein in costly AOB abuses. The statehouse stays in session only until May 3, so there’s a narrow window for enacting strict new AOB laws. Suggest cases. You’re encouraged to suggest civil and criminal cases we’d want to consider for an amicus brief. Click here for the criteria and our other amicus filings. 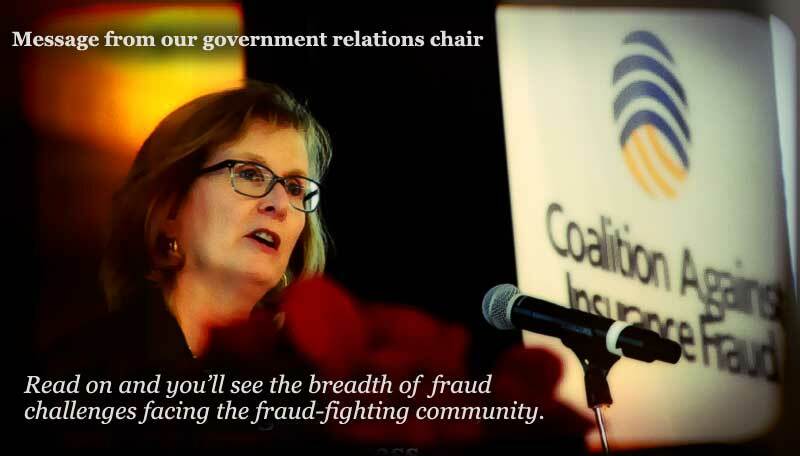 The fraud fight grew stronger than ever when the Coalition adopted its model insurance fraud act in 1995. Imposing strict penalties, it was the most-sweeping — and balanced — such model of its time. Importantly, even insurers could be prosecuted for insurance fraud under the model. Times change, and so does insurance fraud. So the Coalition is updating the model to reflect new technology and other shifts in our landscape. Leaders from insurers, legislators and consumer advocates are involved in the months-long update. The Coalition will review the new model and vote at our midyear member meeting on June 4. NCOIL is expected to vote on its own adoption of the model in July. Coalition member input will be sought this spring. However, feel free to weigh in now with suggested updates. Just write Matthew Smith with your ideas. We urge all members to comment. Together, we’ll make certain our model fraud law remains the gold standard for the next 25 years and beyond. A sweeping draft SIU regulation seeks to improve the quality of insurer fraud referrals to the California insurance department. The goal is worthy, yet the draft goes too far and would make insurer fraud-reporting far more onerous. That’s the consensus of many industry experts as the department considers overhauling the current SIU rule. In general, the department seeks better referrals rather than “checkbox” ones that merely meet the minimum state requirements for insurer reporting. Some of the draft provisions are directed toward a growing number of insurers contracting out SIU services. Many observers believe the draft overreaches. The department is seeking initial comments before the formal public review begins. • Claim documents can have no information redacted from claims documents. This could void attorney-client privilege, many observers say. One potential change: Simply provide the insurance department with a privilege log listing what was redacted. • Compliance training also would be required of hired investigative contractors. Yet the rule inadvertently would mandate training of vendors that merely assist the insurer SIU, instead of firms performing “integral” SIU functions. • Insurers would have to provide the insurance department staffing and case referral data from around the U.S. This is potentially unnecessary and overreaching, some observers say. The insurance department’s updating is attracting plenty of discussion inside the anti-community around the U.S., given California’s size and regulatory stature. The Coalition took an active role in the insurance department’s standing-room-only meeting in Sacramento in March. The department sought initial comments to help refine the draft before the public hearings begin. Requiring high-quality case referrals from insurers is a worthy regulatory goal, the Coalition told the insurance department. The insurer “checkbox” approach reduces valuable case leads and allows more fraud to go unchallenged. However, the rule should avoid erecting barriers that inadvertently defeat this goal, the Coalition urged. Law firms play an important role in advancing the fraud fight. 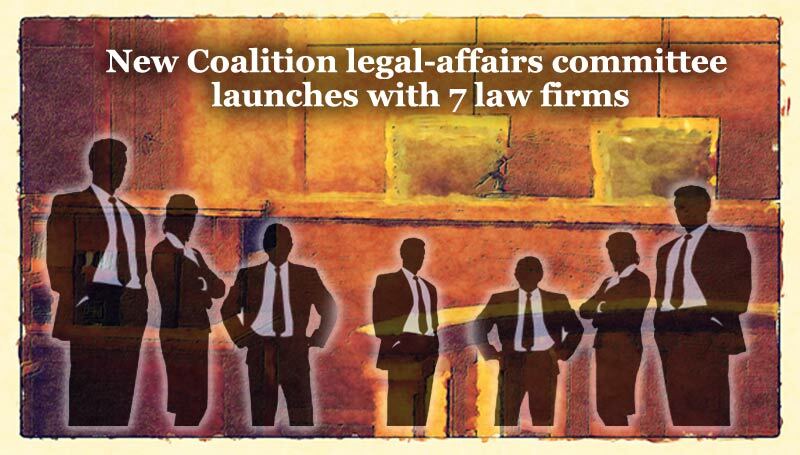 So the Coalition is inviting top-tier law firms with proven anti-fraud expertise to join. Membership is by invitation-only. They’ll help identify ground-breaking cases for amicus briefs. … write amicusbriefs … advise on new laws and regulations so the Coalition’s member database stays continually updated for members.